Rabbi Abraham Abraham, the leader of the Ice Breakers Winter Ocean Swimmers of Brighton Beach, died on May 18, according to club spokesman Bob Stewart. 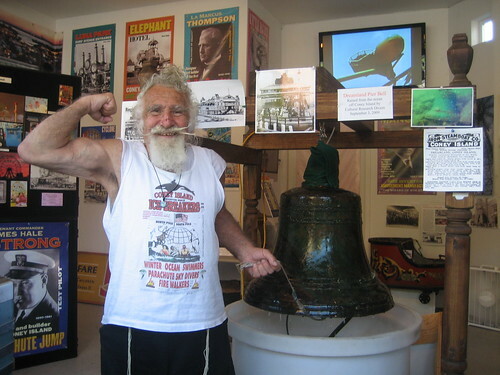 “The Rabbi,” as he was called by his fellow swimmers, was a longtime member of the Coney Island Polar Bear Club until the 1990s when he broke away after a dispute and formed a club called the Ice Bears and then the Ice Breakers. The funeral will be held on May 19 at 2 pm at Beth David Cemetery in Elmont, Queens. The elaborately mustachioed and white-bearded Rabbi was a colorful Coney Island character famous for his daily swims and annual New Year’s Day Swim at Brighton 6th Street. The Ice Breakers boast of having the largest number of active swimmers over 70 years of age (10 swimmers) and four members over 80 years of age. Stewart estimates that the Rabbi was 83 or 84, though he would never admit exactly how much over 80. Rabbi Abraham Abraham’s zaniest personal accomplishment was probably living in an ice house for 110 hours (Guinness record ID 12729 claimant 12524) on the beach. We’ll never forget his royal antics as King of the Mermaid Parade in 1999. He was so full of fun that he kept jumping out of his rolling chair to dance a jig, which is something we haven’t seen a king do before or since. Photographers loved him, of course. With his white hair and flowing beard, the Rabbi was probably the king who most resembled Neptune. In this 2009 video he extols the health benefits of eating organic kosher food and winter swimming in the frigid waters of the Atlantic. 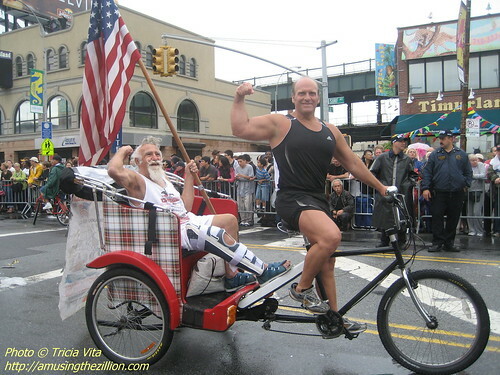 In the above photo taken by ATZ at the 2009 Mermaid Parade, the Rabbi rode in a pedicab due to a leg injury from what he said at the time was a parachute skydiving accident. “But it was bone cancer,” Stewart reveals. “They removed his thighbone and replaced it with a titanium rod.” The next year, he was once again walking the length of the parade route. “He’s such a positive guy,” says Stewart. “He called me two weeks ago and said, ‘Bob, I’m dying. I need to see you.’ So I went over to his house. And then he said ‘listen, do you think we can do one more gig before I die?’ Here’s a guy on his deathbed and he wants to do one more something–swim, Mermaid Parade…” They agreed to ride the pedicab again in the Mermaid Parade, which takes place this year on June 18th. “But we knew it was getting close, it was day by day,” Stewart adds. The Ice Breakers are planning to march in the Parade with a photo of their departed leader.